Distance from San José: 241 kilometers. Dry season: February, March, June, September and October. Gandoca-Manzanillo Wildlife Refuge located about 12 kilometers southeast of Puerto Viejo, and just south of the small village of Manzanillo on Costa Rica’s Caribbean Coast is one of the most beautiful and scenic sites in the country. Fine sandy beaches, gentle waves, coral reefs near the surface of the sea all make this region a paradise for nature lovers and underwater enthusiasts. The terrain of the refuge is flat to gently rolling with the hills consisting of sedimentary rocks formed by the River Banano no higher than 100 meters above sea level. Creatures found on the reef include lobsters, sponges, red and black urchins, green anemones, crabs, hydroids, sea cucumbers, shrimp and on occasion green turtles. The refuge protects many species of animals that are either endangered such as the crocodile and the tapir, or whose population has been reduced dramatically like the cayman, pacas, keel-billed toucans, and ornate hawk-eagles. There are also mammals such as the tapir, rodents and manatees, as well as other large lizards and snakes. 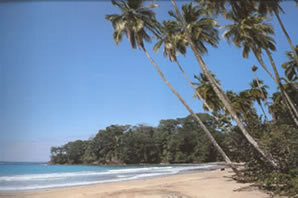 This refuge is located about 12 kilometers southeast of Puerto Viejo, just south of the small village of Manzanillo.